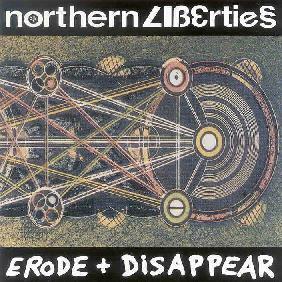 Northern Liberties - "Easter Island" 7" / "Erode + Disappear"
Northern Liberties have several releases on the World Eater label, which is a non-profit label. All the CDs are $5 and 7" records $3 including postage! This is the second release on the label and includes 18 tracks from 1-5 minutes in length. The band play a mixture of punk inspired rock. They remind me of some of the punk bands that I saw at the Gilman St. in Berkeley, California, when I went there nearly every Friday or Saturday night back in 1988-90. Easter Island is the bands second release on World Eater. It was recorded on Easter Day 2003, thus the title. The band consists of a three piece (guitar, bass, drums). The lyrics are quite potent and the music heavy and distorted. The recording is quite low with the drums and bass mixed high and the guitars low. This is distorted rock with a punk attitude. Melodic at times, yet screaming raw all the time. Strange and intriguing stuff.